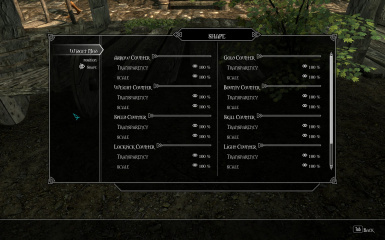 A mod to show various information on HUD via widgets. If you happen to have left over script artefacts in your savegames, I recommend using Script Cleaner. A Widget Mod. Why you ask? Well primarly because I can...finally. It imports various widgets to display diverse information on your HUD for convenience reasons, so you don't need to enter any menus. Player related Widgets are: Number of arrows in your inventory/currently equipped and the name of the ammo type. A Gold counter showing Gold in your inventory. A widget to display your carry weight/inventory weight. A global and regional bounty counter. A Widget to show Player level, experience points needed for current level, and expereince points you already have for current level. A speed/jump height/fall height Widget, which probably only has relevance if you are using progressive speed/jump height Mods. A Lockpick counter, and a Widget to show currentlight level making it easier to determine when you are walking in the shadows. 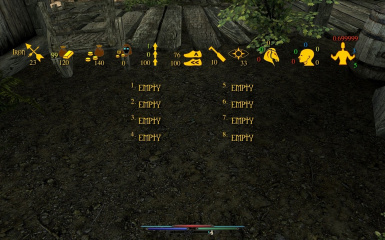 A attribute widget showing player heal, stamina and magicka regeneration rate, as well as heltah, stamina and magicka in numeric values. Finally there's a text based Widget that shows, by name, which items you have hotkeyed. Not Player related Widgets: There's a widget for owned horse (doesn't work for stolen horses), that shows you health, stamina, distance (in meters) and name of the horse. Another widget adds support for one follower, showing health, stamina, magicks, level, distance(in meters) and name of the follower. Configuration: Widgets can be turned off/on in MCM menu and readjusted as well. You can change their position, size and transparency. There's also an optionto adjust the interval of the update timer, to make it less of a burden for slow systems. This Mod makes extensive use of .as & .fla code provided to us by Team SkyUI. So ALL credits go effectively to them. I'mjust taking up the code they gave to us and try to make the best out of their source. If you have FISS installed you can also save/load user presets. - It's compatible with everything. Lots of planed features. Dynamic Widgets, Color reconfiguration, Fonts reconfiguration and Icon change function. In this case I'll have to thank Bethesda, the Creation Kit Wiki guys and the official forum guys and especially the whole SkyUI-Team, specifically @Schlangster, @psychosteve and @Mardoxx which granted us the gift of cracking the Skyrim UI code open. Thanks to SKSE-Team as well. You guys rock! Thanks to @LordConti2 for making his FISS library which files are partly included inside this Mod. Thanks to him we can easiyl save/load user presets. Enough talk now, count me a widget!